The sign outside tells the story at the former Grynn & Barrett studios in Holyoke. And that adjective could also be applied to the eventual buyer — the college, he told <em>BusinessWest</em>. That’s because the HCC campus, located almost across the street from the photo studio, is land-locked, and what little vacant land exists on the campus is, by and large, undevelopable, due to environmental and logistical concerns, he explained, recalling the many difficulties with the last new-building project — the Kittredge Center for Business & Workforce Development. Meanwhile, some of the facilities on the campus, built in the early ’70s, are starting to show their age — and their limitations. This is especially true in the Marieb Science Building, which houses both health and life-sciences programs, said Kathey Hankel, dean of Health and Natural Sciences. 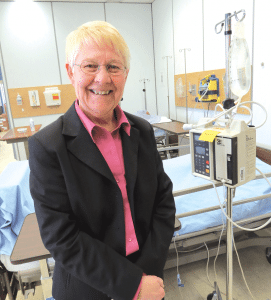 She and Messner said that, while the programs conducted there, especially nursing, are in demand and highly rated, they are offered in cramped quarters, with some labs, including those used for biology, that are seriously out of date. The opportunity to expand and modernize those facilities is what inspired the college to become motivated when it came to the Jarvis Avenue property, said Messner, noting that the school is now moving forward with a multi-faceted, $15 million initiative centered around creating its new Center for Health Education in the 22,000-square-foot Grynn & Barrett building. Plans call for moving the nursing program, the radiology technician (rad-tech) offering, and the medical assisting program from the Marieb building to Jarvis Avenue, said Hankel, and then renovate the vacated space to create what will be called the Center for Life Sciences, which will feature larger, more modern life-sciences facilities than exist now, including a clean room that should create new and intriguing learning experiences. The Grynn & Barrett building, only a decade old, is both modern and flexible, with large amounts of open space, said Hankel, making it ideal for conversion into classrooms, labs, and other learning facilities. Current plans call for using the top floor for offices and conference rooms for faculty, said Hankel, adding that the ground floor will be used for teaching, with one large classroom and several small ones envisioned. The center will also include a simulation lab that will be much larger and better-equipped than the one currently used at Marieb, a ‘low-tech’ lab, and a radiology suite with a dedicated classroom and state-of-the-art equipment. The renovation of facilities in Marieb Hall will be equally significant, said Hankel and Messner, adding that the aqddition of a clean room — which they believe will be the first one at a college or university in this region — will be of significant benefit in the training of individuals for in-demand jobs at testing facilities, such as Agawam-based Microtest. In fact, Microtest CEO Steve Richter was among those who lobbied the Center for Life Sciences to award HCC the $3.9 million grant for the project, said Messner, because he understood the importance of the initiative to workforce development in the growing life-sciences sector. While plans for these twin, related initiatives are blueprinted, fund-raising efforts continue to finance them, said Messner. He told BusinessWest that the school received a $3.9 million grant from the Center for Life Sciences for the project, and is going about the task of raising the rest, largely through a capital campaign. As part of these efforts, school officials are working to meet a unique, $1 million challenge grant from Elaine Marieb, an HCC alum (nursing), former faculty member (biology), author of more than a dozen anatomy and physiology textbooks, and frequent contributor to the college; it’s her name on the science building. Marieb’s challenge grant is different from most, because the challenge isn’t based on the dollar amount — although that number is a goal as well — but rather on securing 1,000 donations. Kathy Hankel says the new Center for Health Education will enable HCC to expand its nursing programs and thus help meet what is expected to be great demand for qualified professionals. “She wanted to get a broad base of people involved in this initiative,” said Messner, adding that organizers now have 800 pledges and are moving closer to securing enough funding to commence with the project. No firm timetable is in place, but the school is hoping to get started on the Jarvis Street phase of the project by the end of this summer, said Hankel, who anticipates a number of benefits from both phases of this initiative. For starters, the school can expand its nursing program, which currently boasts enrollment of 110, by 24 to 32 students, she said, adding that the school is looking at introducing a program focused around evening, weekend, and online offerings, which will be attractive to students who must also work full-time. And the additional enrollment is important, she said, because while the shortage of nurses that visited the region several years ago has eased somewhat, due largely to the sluggish economy that persisted for several years, demand for nurses will soon escalate as older members of the profession move into retirement. “We had a period for a few years when the economy tanked and no one retired,” she explained. “Now, the economy’s coming back, and nurses are retiring in record numbers, and there will be a huge shortage, perhaps one larger than we initially thought. 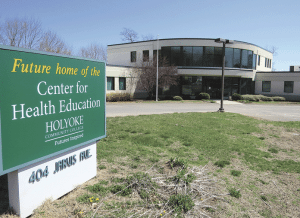 Meanwhile, relocation of the health-science programs to Jarvis Avenue will enable students and faculty there to become involved in the community, and especially three neighbors to the Grynn & Barrett building — Sullivan Elementary School, Loomis Communities, and the Bowdoin Village low-income housing facility. Students are already involved with these institutions to one extent or another, said Hankel, but the relocation will enable these efforts to escalate. At the housing complex, run by the Holyoke Housing Authority, HCC students have conducted surveys of residents to identify areas of need that the college might help address, she went on, while also undertaking blood-pressure screenings and efforts to provide medical information to those living there. The move to Jarvis should facilitate efforts to expand those initiatives. And at Loomis, a multi-faceted senior-living facility, students can get valuable experience in geriatric care, which, with the aging of America, has become a field experiencing explosive growth that will only continue in the years to come, she said.